If you close your eyes and imagine a custom closet that is full of hangers and shelves, you might be missing some of the story. Custom closet design involves all kinds of useful accessories intended to maximize your space and improve your homes efficiency. For your convenience, we have shared our 7 favorite tools for organizing your custom closet. In your walk-in closet, there is no excuse for wasted space. If you have lamented the lost space in your closet corners, you should use corner shelves to connect the walls and give you a place to store bulky items like off-season clothes and blankets. For some things, you just need baskets instead of shelves. Pull-out wire baskets are lightweight but strong and can hold quite a bit. They help you to keep smaller items off the floor, and provide an excellent spot for T-shirts, jeans and linens. Even though your closet is a private place, you still don’t want to show off everything you have. This is what a built-in hutch was designed to do. A professionally-crafted custom hutch helps to hide belongings you do not want to emphasize, and gives your closet a more tightly-organized appearance. 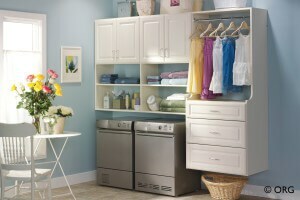 A walk-in closet would be deficient if it did not provide you with a viable place to organize, as well. A custom closet island offers you plenty of room to sort your shoes, fold your clothes and plan out your wardrobe for the week. It also lends an air of class to your closet, like you might expect in a high-end boutique. Mirrors in the closet can be both a blessing and a curse. They are crucial to help you see how you look. They are a nightmare when you dont want to examine yourself. A pull-out mirror solves this problem. For the width of a single hanger, you can see what you want and put it right away when you are done. If your closet system is a bit tight on space, you will love the wonders of a pull-down wardrobe rod. It allows you to access things you have stored up high. You can also use an empty rod as a handy place to help you sort, or place tomorrows clothing for quick access. Society has long suffered for want of a good place for the ironing board. Now you have the solution in a pull-out ironing board. Built as part of your custom closet design, it is right where you need it. The ironing board swivels out and then folds away quickly, as if it were never there. The best part of a custom closet is that you get exactly what you need. With these custom closet design hacks, you can keep your closet organized, easy to use and clutter-free. If you’re interested in learning more about custom closets, request a free quote from our team today!